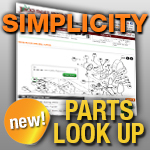 Jack’s has a large selection of replacement Simplicity Lawn Mower Belts for your Simplicity mower or tractor. Trust Jack’s for all your Lawnmower replacement part needs! We have replacement Simplicity Belts by Size, Exact Replacement Belts and V Belts.